The article below by Professor Joan Roelofs is reproduced with permission from CounterPunch. 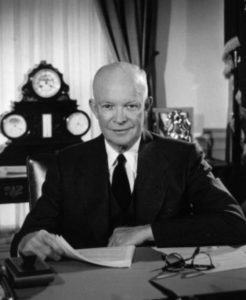 In 1961 President Eisenhower (pictured) in his last public address to the American people warned us about the danger to democracy and accountable government presented by the military/industrial complex. You can imagine how much stronger the complex is 57 years later after decades of Cold War with the Soviet Union. Professor Roelofs has done a good deed for the American people and for the world in assembling such extensive information documenting the penetration into every aspect of American life of the military/security complex. It is a delusion that a mere President of the United States can bring such a powerfull, all-pervasive institution to heel and deprive it of its necessary enemy. called the military-industrial-congressional-almost-everything-complex. Most departments and levels of government, businesses, and also many charities, social service, environmental, and cultural organizations, are deeply embedded with the military. 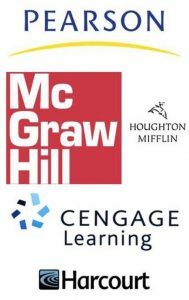 industry, in fiction, nonfiction, and textbook offerings been examined. Yet the influences on this small but significant population, the reading public, and the larger schooled contingent, may help explain the silence of the literate crowd and college graduates. Military spending may be only about 6% of the GDP, yet it has great impact because: 1. it is a growing sector; 2. it is recession-proof; 3. it does not rely on consumer whims; 4. it is the only thing prospering in many areas; and 5. the “multiplier” effect: subcontracting, corporate purchasing, and employee spending perk up the regional economy. It is ideally suited to Keynesian remedies because of its ready destruction and obsolescence: what isn’t consumed in warfare, rusted out, or donated to our friends still needs to be replaced by the slightly more lethal thing. Many of our science graduates work for the military directly or its contractee labs concocting these. findings are the extensive military stock holdings of CALpers, the California Public Employees Retirement System (the sixth largest pension fund on earth), the California State Teachers Retirement System, the New York State Teachers Retirement System, the New York City Employees Retirement System, and the New York State Common Retirement Fund (state and local employees). Amazing! the New York City teachers were once the proud parents of red diaper babies. The governmental side of the MIC complex goes far beyond the DoD. In the executive branch, Departments of State, Homeland Security, Energy, Veterans Affairs, Interior; and CIA, AID, FBI, NASA, and other agencies are permeated with military projects and goals. Even the Department of Agriculture has a joint program with the DoD to “restore” Afghanistan by creating a dairy cattle industry. No matter that the cattle and their feed must be imported, cattle cannot graze in the terrain as the native sheep and goats can, there is no adequate transportation or refrigeration, and the Afghans don’t normally drink milk. The native animals provide yogurt, butter, and wool, and graze on the rugged slopes, but that is all so un-American. Military bases, inside the US as well as worldwide, are an economic hub for communities. The DoD Base Structure Report for Fy2015 lists more than 4,000 domestic properties. Some are bombing ranges or re-cruiting stations; perhaps 400 are bases with a major impact on their localities. The largest of these, Fort Bragg, NC, is a city unto itself, and a cultural influence as well as economic asset to its region, as so well described by Catherine Lutz in Homefront. California has about 40 bases (https://militarybases.com/by- state/), and is home to major weapons makers as well. Officers generally live off-base, so the real estate, restaurant, retail, auto repair, hotel and other businesses are prospering. Local civilians find employment on bases. Closed, unconvertible installations are sometimes tourist attractions, such as the unlikeliest of all vacation spots, the Hanford Nuclear Reservation. National, state and local governments are well covered by the “insecurity blanket;” the nonprofit sector is not neglected. Nevertheless, it does harbor the very small group of anti-war organizations, such as Iraq Veterans Against War, Veterans for Peace, World Beyond War, Peace Action, Union of Concerned Scientists, Center for International Policy, Catholic Worker, Answer Coalition, and others. Yet unlike the Vietnam War period, there is no vocal group of religious leaders protesting war, and the few students who are politically active are more concerned with other issues. Nonprofit organizations and institutions are involved in several ways. 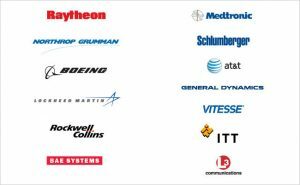 Some are obviously partners of the MIC: Boy and Girl Scouts, Red Cross, veterans’ charities, military think-tanks such as RAND and Institute for Defense Analysis, establishment think-tanks like the American Enterprise Institute, Atlantic Council, and the flagship of US world projection, the Council on Foreign Relations. There are also many international nongovernmental organizations that assist the US government in delivering “humanitarian” assistance, sing the praises of the market economy, or attempt to repair the “collateral” damage inflicted on lands and people, for example, Mercy Corps, Open Society Institutes, and CARE. Major liberal foundations have long engaged in covert and overt operations to support imperial projection, described by David Horowitz as the “Sinews of Empire” in his important 1969 Ramparts article. They have been close associates of the Central Intelligence Agency, and were active in its instigation. 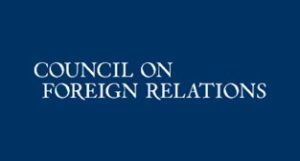 The foundation-created and -supported Council on Foreign Relations has long been a link among Wall Street, large corporations, academia, the media, and our foreign and military policymakers. Colored People (NAACP) from Lockheed; Boeing also funded the Congressional Black Caucus. The former president and CEO of the NAACP, Bruce Gordon, is now on the Board of Trustees of Northrop Grumman. among those eligible are Big Brothers/Big Sisters, Boys and Girls Clubs, Boy Scouts, Girl Scouts, Little League Baseball, and United Service Organizations. The Denton Program allows non-governmental organizations to use extra space on U.S. military cargo aircraft to transport humanitarian assistance materials. 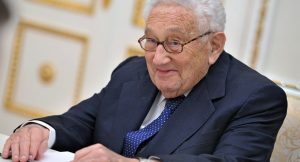 National Intelligence’s Senior Advisory Group, the Trilateral Commission and the Council on Foreign Relations.” Lifetime Aspen Trustees include Lester Crown and Henry Kissinger. “The Nature Conservancy is an organization that takes care of people and land, and they look for opportunities to partner. They’re nonpolitical. We need nongovernment organizations like TNC to help mobilize our citizens. They are on the ground. They understand the people, the politics, the partnerships. We need groups like TNC to subsidize what government organizations can’t do” (Mamie Parker, Former Assistant Director, U.S. Fish and Wildlife Service and Arkansas Trustee, The Nature Conservancy). The DoD does not shun the work of Federal Prison Industries, which sells furniture and other products. A government corporation (and thus not a nonprofit), it had half a billion in sales to all federal departments in 2016. Prison labor, Goodwill Industries, and other sheltered-workshop enterprises, along with for-profits employing immigrant workers, teenagers, retirees, and migrant workers (who grow food for the military and the rest of us), reveal the evolving nature of the US working class, and some explanation for its lack of revolutionary fervor, or even mild dissent from the capitalist system.